Because she cannot walk, I am keeping her near me as much as possible to help her drink water during the day. I know some students are uncomfortable around cats, and for those classes, Nimmy will be downstairs in her usual spot. Please let me know if your child has an allergy or would for any other reason be more comfortable with the cat downstairs during his or her class. — Nimue is 16 years old (very old for a cat!) and has had a wonderful life full of toys, yummy treats, and people she loves. — She is still purring and looking out the window at the birds. In her bed is a wool sweater which reminds her of being a baby kitten with her mother. — Although her body is weak, the vet has given her medicine so she is not in pain. — Taking care of a sick animal is different from taking care of a sick person because they cannot speak and tell us what hurts. That is one reason Nimmy’s medicine is so strong. — We are all sad about her illness and hope she gets better soon, but the most important thing for us is to keep her comfortable and happy. I am sorry to bring a sad post to you, but thank you all for your patience and understanding. Many Boston-area schools run a wonderful after-school child care program called Extended Day. Information about the Baker School program, for example, can be found here. It is important to note that this is not an academic program like after school institutes (such as the hagwon in Korea). Originally begun when working mothers led to latchkey kids who were left at home alone after school, this program gives your child an opportunity to play with other children under adult supervision if you are not able to be home. In past years, we have had students attend this program to get more exposure to English. Sometimes parents want their child to speak only in English during this time, in order to learn the language. However, many children will want to play with others who speak their native language. If your child attends a school with many other students from the same country, this is a good opportunity for them to relax and enjoy their first language. Because this is a social – not academic – time, that comfort of speaking in the language they choose is nice, especially after a long day struggling to listen to and speak in English at school. It has been difficult for some of our students who want to follow their parents wishes that they speak English when they see their friends speaking in their home language. Our students have compared Extended Day to recess, an enjoyable time for them to relax and play games (we grown-ups know that these “games” are also teaching them lessons in art, science and more!). Parents can be confident that this play happens in a structured and supervised environment. There is a quiet period for doing homework – we recommend making sure your child feels comfortable asking the supervisors for help with any questions, because at the end of a long school day, some children may feel more shy and will not speak up. Your school’s Extended Day Program can provide after-school care for your child if you have to work, but it is also a supportive environment for them to socialize in English and speak in their native language. We Two Tutoring will be closed Friday, August 17 for professional development. We apologize for the inconvenience and will see you on Monday! First of all, we will now return to more frequent posts after two weeks of only book reviews. Thank you for your patience! It got pretty busy around here with several new students, and the blog had to be ignored for a few days. Because we don’t follow a set curriculum, the first few classes with a new student require extra preparation and follow-up. Personally, I take several hours – not all at one time! – to reflect on a student’s interests and personality. “What made her the most talkative?” “What did his body language communicate?” “Does she respond better to humor or serious discussion?” I use this reflection to develop possible lesson plans; for a new student, I often create several lesson plans for just one class because I know I will learn more about the student during that very class! This is a very interesting process for me – I love the challenge of tweaking my lessons to best fit each student, as well as the joy of discovering the new mind and personality sitting beside me. We also wanted to tell you that we are moderating comments on this blog. We want this to be a safe place for our students to visit, so no comment will be posted without Allison or Jennifer reviewing it first. Criticism is acceptable if it is not done rudely or using inappropriate language – ask yourself, “Would I say this if my grandmother could hear me?” I bet there are already some spelling or grammatical errors on this young blog and I would love to get your corrections! Commenters, this does mean you won’t see your comment right away, unfortunately. However, it is more important to keep the conversation clean and kind so that everyone can participate. That’s it for now, friends. You will see an advanced grammar challenge posted this evening and later this week we will post two book reviews, a review of some neat vocabulary software, and a writing game we use in class which families might enjoy playing together, too. Stay cool! 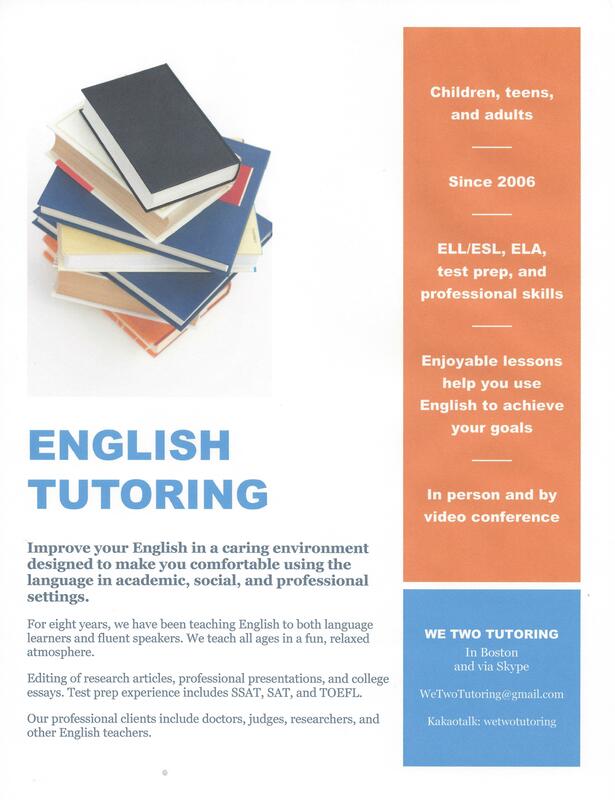 Welcome to We Two Tutoring’s new website. Allison and Jennifer are so excited to have you here! In upcoming weeks, you will see book reviews, educational resources, and family activities posted here. We will also use this website to post any announcements and let you know what special topics we are covering in class or on the Yellow Bookcase. Say hi in the comments below! If you want, you can let us know if there is anything you especially hope we will discuss here.